Our campers come from all over the United States and from around the world! In 2017, we had campers from 10 different states. We have had campers from Spain, Germany, Japan, Russia, Guam, China, Switzerland and Italy! Our food is soooo good! And, if you’re interested, you can learn to cook at Camp Eagle Ridge. To learn more about our typical meals, our garden and our Food Revolution, go to our Food & Dining page. What kinds of activities will I get to do? Activities include: Sailing, Paddleboarding, Kayaking, Canoeing, Basketball, Soccer, Volleyball, Tennis, Golf, Martial Arts, Archery, Wrestling, Sumo Wrestling, Football, Dance, Drawing, Painting, Outdoor Living Skills, Lacrosse, Rugby, Improv, Kickball, Gaga, Gardening and more! Find out more on our Activities page. We go on day trips! Choose from trips such as: rock climbing and rappelling, volunteering at the animal shelter, hiking Copper Falls, berry picking in Bayfield, working with Alpaca at Suri-Fina farm, hiking Mt. Whittlesey and more! Check out some of our trips here! Can I bring my iPod, iPad, cell phone, or other electronics? We encourage you to “unplug” for your camp adventure! If you choose to bring a cell phone or other “internet accessible” device, it will be collected upon arrival and stored in the camp office until you leave. We’d really prefer that these devices were simply left at home. Camp Eagle Ridge will not be held responsible for these items. Electronic readers, such as Nooks or Kindles, can be brought and used at camp if they cannot be used for any other purpose. Parents are always welcome at camp; however, it is rare that parents visit. If your parents wish to arrange a visit, they may do so by calling the camp office. 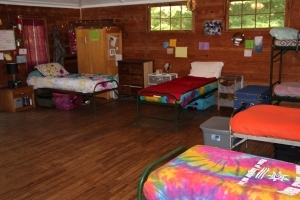 If you stay at camp four weeks or more, you may call home once during your stay. The call would be arranged with the camp director. You may also receive a phone call from your family on your birthday. You will live in a log cabin with about 6-12 (depending on your age) boys or girls that are close to your age. A counselor (or two) and a Counselor-In-Training or Junior Counselor also live in your cabin with you. Most cabins have a mix of single beds and bunkbeds. Each camper also gets a nightstand/cubby for their bed. There are 5 girls’ cabins and 5 boys’ cabins. Where do we take showers? We have a central shower house with 7 private shower stalls for boys and 7 private shower stalls for girls. Each shower has a private changing room attached to it. Every cabin has a designated shower time so that everyone showers once a day. Campers also have the option of showering during free time. Camp typically has great summer weather. We usually wear shorts and t-shirts during the day and sweatshirts and long pants at night. It can get quite cool in the evening. You’ll definitely want to bring tennis shoes for sports and a pair of water shoes that won’t slip off your feet (Tevas, aqua socks or anything with an ankle strap). For campers that stay longer than one week, we do laundry once a week. Each cabin has a laundry day. You take your laundry bag to the shower house with your cabin and it is washed, dried and return to you by the end of the day. You are responsible for checking your pockets and deciding what to wash. We don’t recommend bringing any delicate items that need special washing instructions. You are responsible for folding and putting away your own laundry. What happens if I have a birthday during camp? Birthdays are a big deal at Camp Eagle Ridge! We will make a special dessert in your honor and make it a very special day! 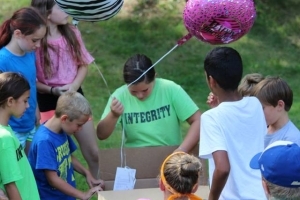 Parents may send packages ahead of time to be stored in the camp office until your birthday.